outnumber the cells in our body by about 10 to 1 >>>>>>>>>> Wow! I used to think all Probiotics were the same but I have since learned that there are many strains of probiotics and each has a different function. So now I have switched out my usual probiotic for one that is made for women as I am happy to say I am a woman! I like that my new probiotic has a Feminine Flora Balance that supports my vaginal health. 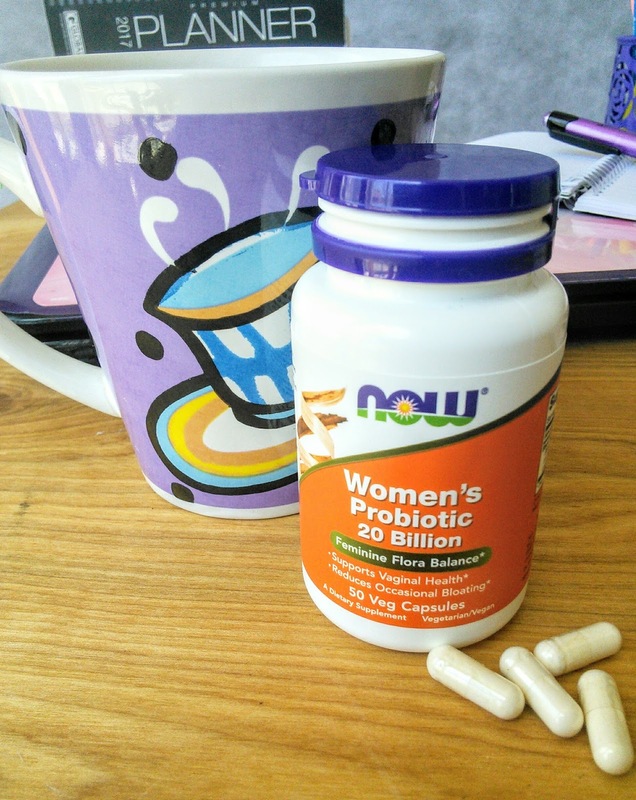 NOW® Women’s Probiotic 20 Billion is specially formulated using three clinically tested probiotic strains to support women's health through every stage of life. * The strains L. rhamnosus HN001 and L. acidophilus La-14 are the ones that attracted me to this probiotic. These strains have been shown to colonize the vaginal tract and help to maintain healthy vaginal pH and that is something that I need as I tend to get plenty of yeast infections. I also love that my new Now Women's Probiotic helps reduce the occasional bloating. For my vegetarian friends, you will be happy to know that this supplement is vegan/vegetarian and also gluten free! This orange and blue bottle has been sitting on the table next to my computer so I will remember to take one small capsule every day. 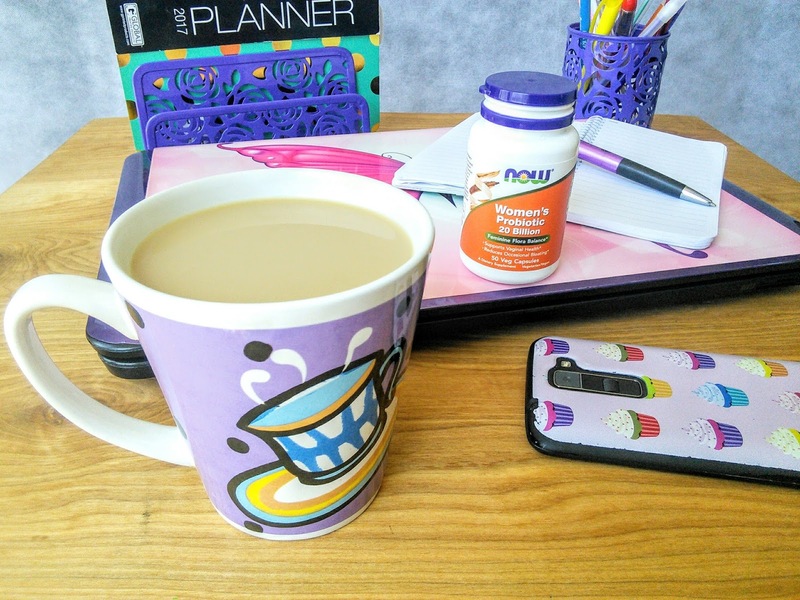 It is funny how I can remember to have my coffee every day but tend to forget to take my probiotic. I know that a daily probiotic will help support my immune system and now that I have one with strains to help down there, that makes me even happier. Another thing that makes me happy is how Now verifies their probiotic strains. identify potential bacterial contaminants prior to production. So just like that cup of coffee is part of my daily routine so is Now Women’s Probiotic 20 Billion. In fact, my whole family takes a daily probiotic as it is great for our overall wellness and gut health. My boys, including the teen, love their probiotics in a chewable form. 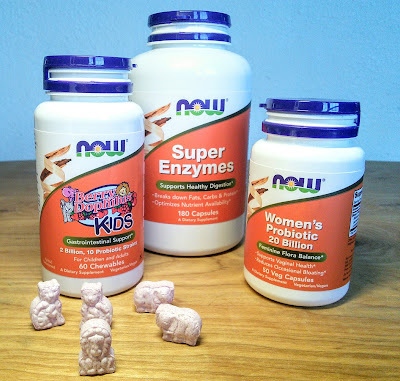 My boys love the cute animal shapes of Now Foods BerryDophilus™ Chewables and I love that they are sweetened with Xylitol. 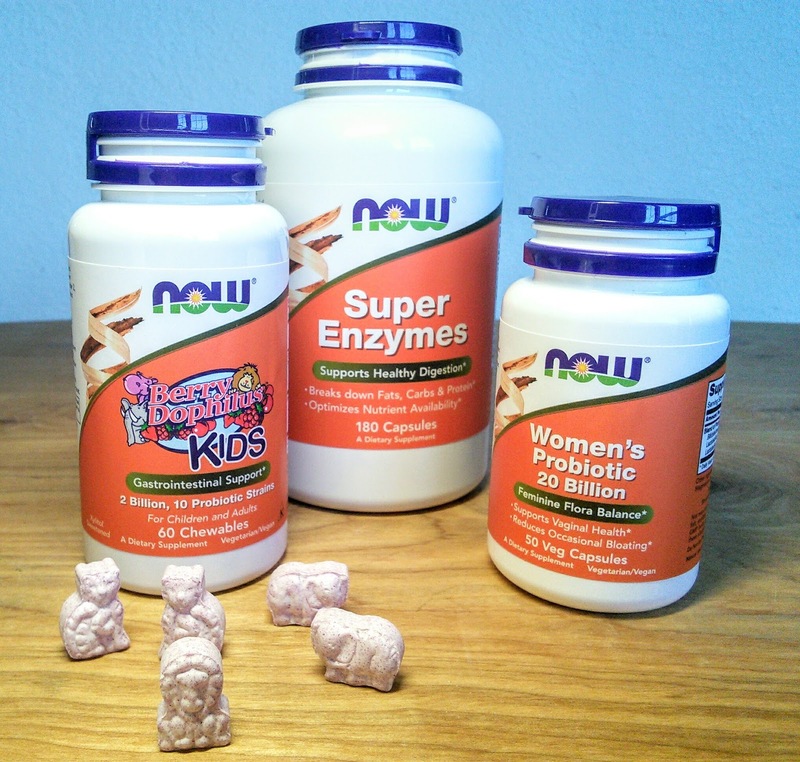 Another Now product that helps with Nutrient Availability* is Super Enzymes. I love taking one after my main meal to help with my digestion. Do you take a daily probiotic? What kind of strains are in it? Check out this video! It does a great job of explaining why we need probiotics. I have a bottle of Now Foods Women's Probiotic 20 Billion to give away to one lucky reader. Just enter on the form below and good luck! I recently bought the NOW Foods Nutritional Yeast Flakes, but I haven't tried it yet (I'm still on my previous bottle from a different brand). I hope it's good! I'd also be interested in trying their Agave Nectar. I would love to try the NOW Clarify & Illuminate Moisturizer to help brighten my skin which is dull from the winter cold and wind. I would like to try NOW's COQ10 Antioxidant Serum. I's love to try some of their green food products like Chlorella. I currently use their vitamin D and I love it. I would like to try Biotin. I'd also like to try their NOW Dark Spot Serum. I would like to try the Aloe Soothing Gel. I would like my oldest dog to try the Joint Support Chewables for Dogs & Cats. I would like to try the COQ10 Antioxidant Serum. I have been looking for one and this one sounds great. I would like to try the probiotics as well as XyliWhite™ Cinnafresh Toothpaste Gel because it hard to find toothe paste in the store that isn't filled with nastiness. I would love to try to sprout their Organic Alfalfa Seeds! Have you tried the Organic Quinoa Penne Pasta? It is SO delicious!! I'd also love to try their Avocado Oil. I'd like their lavender essential oil. I would like to try their Peppermint Essential Oil. The avocado oil is just what I need, thank you so much for the offer! Would love the coconut oil! I really like NOW products & have been using them for years! In the past I used their Bromelain & Quercetin supplements (shortish term, for anti-inflammatory purposes), and am using their zinc picolinate supplement to help with skin & hair. I'd like to try their flax oil 1000mg softgels as a vegetarian omega3 source. I like Now products. I would buy the /pycnogenol vitamin as its supposed to be very helpful. Flyergal82 at (yahoo /dot' \com? I love Now Foods and would love to try their Wheat Grass Juice Powder because Ive heard such great things about it and I feel like it would really improve my overall health. I would love to try the Geranium Essential Oil for spring! I'd like their Vitamin D as I'm low on it. I would like to try the Neptune Krill oil. The neptune krill oil looks like a product that I would love to try. They have a very nice selection of products. I would like to try their Organic Peppermint Tea. I like the COQ10 Antioxidant Serum from NOW the most of all of the fine products available on the website.